NHL’s kindergarten class will be having a Thanksgiving feast for all of the kids and their families later today. We were asked to send in an item that is special and represents our culture/heritage/religion. 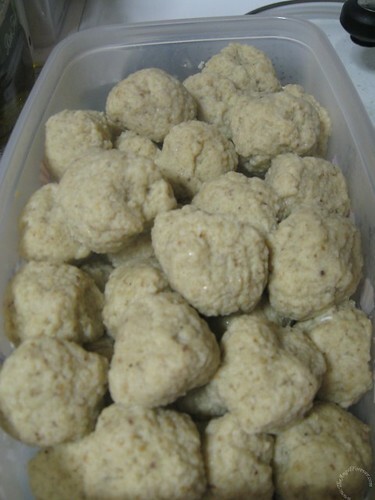 JL and I came up with a few ideas, but NHL made his decision the minute he heard the word matzo balls. I know, it sounds strange sending in matzo balls to a Thanksgiving feast, but this group of Pilgrims will have them in their bellies. It had been quite some time since we had made matzo balls on our own. I bought matzo meal and eggs and was all ready to go. Last night, we decided to make six times the batch on the package. According to that, it would make approximately 48 of the yummy wonders that would be one inch in diameter. 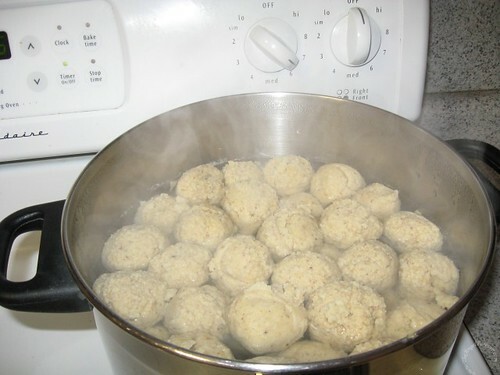 Here are 43 matzo balls just after they were put in the pot for their 30-40 minute "bath" in boiling water. Of course, JL and I had to taste test one to make sure they were acceptable. YUM! Our entire house smelled like Passover. . . in a really good way. These are the final products when they were cooling off to be put away for the Thanksgiving feast. Hopefully, they can be heated without killing them for everyone to enjoy. JSL and I will be heading to the festivities to see how things go and hopefully take some photos to share later. Looks (and sounds) like a great time! If I had any chance of hosting Thanksgiving, it would be much more diverse than the traditional and I would be sure to include matzo balls! I’ll have to keep it in mind for whenever I get my chance! Those look VERYYYYY good! What do you serve with them in the feast?